It was early summer in 1956. I was seven years old. My Granddad, Big Button Estes, and I were going to ride our two-section pasture checking for screwworms. I remember thinking how nice it was to be out of school and riding with Granddad, whose nickname for me was "Tooter." Granddad's ranch was located north of the Greentree Country Club area, part of Block 39 of the Texas and Pacific Railway Company Survey. All ranchers wanted their calves to be born between November and March, but there were always a few that were going to calve after the last freeze. When we worked cattle in the spring, my Granddad and Dad always put those cows in the pastures around the barns so we could watch when they calved and doctor the navels to prevent screwworms from getting started. As we were feeding and catching and saddling our horses, I heard a cow bawl in the distance several times. I didn't think anything about it because cows frequently misplaced their calves at night and bawled until they found them. We rode out into the Two Section pasture and started riding northwest toward the middle of the pasture. Granddad said, "Tooter, we've got to go check on that cow." ​We rode across Midland Draw and up a little rise three-quarters of a mile from the house. Granddad stopped his horse, Jug, to listen and I stopped Little Joe. The cow was bawling about every 3 to 5 minutes and she was coming south down the west fence of the section. Granddad rode forward about 10 yards and stopped again. He was a tall man and Jug was about 15.5 hands tall, so he could see the cow. [A "hand" is a measurement of four inches, used in measuring the height of horses. 15.5 hands would be 62 inches.] My little pony was only about 12 hands and I only saw mesquite brush though I could hear her bawl. Granddad turned Jug and said, "Tooter, we have got to go back to the house." And I said, "Why?" and he answered, "That cow may have rabies. You get in front of me and you make him trot." I turned Little Joe and we started for the house. Granddad was right behind us. We hit a long trot and Little Joe was about to jar my insides out. We came across Midland Draw and Granddad took down his catch rope and busted Little Joe right on the hindquarters. We really did come to the house then! From what I knew, there were a couple of things wrong with what we were doing. First, no child rides in front of an adult. Grownups go first; kids come behind. Second, you never ever trot or run your horse to the barns. That will put you in real danger of getting a spanking because it will ruin a horse very quickly. You always walk your horse to the barn. We got to the pens and Granddad got down, handed me his reins, then shut the gate. He told me, "OK, Tooter, walk the horses in a big circle until I call you." He went to his pickup, then herded all the cows and calves that had come into the west lot into the big east lot, which put them in a different pasture and shut the gate on them. He told me to bring him Jug to and to keep walking Little Joe to cool him out. Little Joe was still really sweaty but had quit breathing hard. Granddad unsaddled Jug, put his saddle away, and put Jug in a small pen that did not have any water. He had me bring Joe to him unsaddled him. One thing that I will always remember is that Granddad took the curry comb and ran it over Joe, then put my saddle away for me as I took Joe to the little pen. He had not done that for me in several years. I was worried about the horses not having any water but I knew that a hot horse drinking water could kill him. We could hear the cow bawl and she was getting closer. We got in the pickup and left. On the way to Midland, I asked, "Granddad, what's wrong with that cow?" He said, "Tooter, I'm afraid she has a bad disease and she can give it to us and all the other animals. I have to get to town and get a big gun and kill her. I hope your dad can come with his rifle and shoot her." We got back to their house on west Tennessee and my grandmother Nanny was really surprised to see us back so quickly. Granddad talked to her a few minutes. Then he called the Superior pipe yard there in town where my Dad worked and said he needed Little Button Estes to call him as soon as possible; that everyone was all right but there was a problem at home. Nanny called Mother and Mom came right down to their house. They all talked a few minutes and Granddad said if "Son" could not get here to shoot her with his big gun, then he and Big Ed Darnell, the sheriff, would have to do it but he wanted to shoot her close to the house so they could pile lumber on the body and burn it. Mother took me home and put me in a hot tub of water and washed all my clothes in Lysol. I am sure she talked to her cousin who was a registered nurse and also to our family doctor. ​Granddad went back to the ranch to watch for the cow and tend to the horses. He told Mother he was really afraid he had gotten my little horse too hot but he had to get me out of there. By that time, Dad had phoned. He was a good way south of Fort Stockton setting up a rig and said he would be home as quickly as he could. Granddad came in about sundown. He said the cow had gotten to the gate about 4:00 and tried to get in the lot. Then she followed the fence around to the dirt tank and pawed and hooked the mud with her horns. She "bellered" for quite a while then walked up the east fence. All the other cattle stood out in the pasture as far as they could and did not go near her. I heard Granddad tell Mother that Little Joe was all right and I was very relieved but this was not a time for children to be talking. Dad arrived home the next afternoon around 1:30. Granddad had been out at the ranch and had probably spent the night in his pickup and had come home about noon. The fear was that she would die in the pasture and it would be difficult to burn her carcass but Granddad had listened all night and she was still on her feet. The thing I remember most about this is that Granddad and Daddy left in the same pickup. They always went in separate trucks. It was very serious. Dad had his big rifle and they left in Granddad's pickup. Mom followed them in our pickup. They left about 2:00 in the afternoon. I stayed with Nanny. I was really worried about Little Joe and the other horses. I was scared about my Mom, Dad, and Granddad. Nanny sat me down at her kitchen table and told me about rabies. Years later Mom told me about how they killed the cow. She said they got to the barn and were relieved to hear her still bawling a little less than a mile away. Mom said it was the most awful bawl she had ever heard. She was raised on a ranch outside of Breckenridge, Texas and had often heard cows bawl for water. But she said this bawl was far worse than that. It raised the hair on the back of her neck. They all walked out in the pasture and decided where Dad was going to drop her. They drove down the outside fence until they could see her. Mom said she had the blind staggers and was bawling almost constantly. The cow would occasionally stop and try to fight a bush or shadow, but mostly she kept staggering and bawling, coming east down Midland Draw. They went back to the pens and Dad got out of the pickup and went out the Northwest gate while she and Granddad waited by the corner post. When the cow was about 50 yards away, Dad walked out in the pasture where he had a clear shot. Mom said that when he stepped out of the pen she was scared to death for him. He let the cow get about 40 yards from the gate and then shot her in the chest. Mother said she didn't even kick. The men would not let Mom get out of the pickup. Granddad had a bunch of old lumber in a pipe rack not far away and he and Dad started carrying lumber. When they had a big pile on top of the carcass, they got the kerosene and set it on fire. Mom and Granddad did not come home until late that night. Dad stayed at the fire in our pickup and came in about noon the next day. He shot two coyotes and a bobcat that were drawn to the smell. He took a pitchfork and threw their bodies on the fire. They burned the cow's carcass three times. Both of them were careful where they walked. The second time they burned her, they tossed all the bones up into a pile and piled more lumber on them and set it afire. Dad burned his oilfield boots in the second fire. I can't imagine Granddad burning his cowboy boots but maybe he did. The third time, about 72 hours later, Dad brought some old oilfield timbers and put them on the few bones left and set those on fire. Dad stayed at the fire the entire time. I don't know how they kept the pasture from catching fire but Dad had big buckets of water he carried from the tank to the burn site. Everyone was concerned. Big Ed Darnell, the sheriff, came out and looked. The game warden came out and looked. Flop Roberts, general manager of the Scharbauer cowboys, came over from Clarence Scharbauer Jr's South Curtis headquarters north of Midland. I believe Daddy had all the horses vaccinated for rabies, which was not common, but we were with our horses all the time. Sometime during all this, Dad sat down and talked to me. He told me that I could not go the the ranch with just me and Granddad because "Daddy can't watch you and get his work done." I couldn't play around the barn and saddle house. I had to stay in the yard unless a grown-up was with me. Everyone was very careful. Nanny seldom went to the ranch; she stayed home and fixed lunch. But that summer she went with Granddad and several times and she and I would stay in the yard. She would pick peaches or apricots and we would check all the bird nests. Our dog could not go to the ranch all summer. Granddad carried a 22 rifle that summer and shot every fox, coyote, or skunk that he saw. Skunks were supposed to all carry rabies. I heard someone east of us had a horse die of rabies. I know Granddad watched our livestock very carefully that summer. He would stand and watch the horses and the cows as they came in and watered. He and Young Lea or Mother rode every day. Any time they saw an animal standing off by itself, they rode over and checked it. It was August before I was allowed to ride with Granddad again. We did not have another animal go rabid, though Granddad shot a fox that he said was "acting funny" and I heard Flop Roberts tell Dad that his cowboys had shot a couple of foxes that were acting strange. *Virginia Estes is a lifelong Midland resident, She often spent time on her grandfather's ranch. Her account of the rabies incident provides a snapshot of West Texas ranching life in the mid-twentieth century from the perspective of a young girl. A century ago the influenza epidemic came to Midland as it did to the rest of the world. Before it waned months later, it completely disrupted the daily routines of this small community, taking a deadly toll. Even celebrations of the ending of the Great War in Europe were muted by the dangers of communal gatherings. And, like that devastating conflict, the disease often claimed the lives of Midland's brave young men. In the United States, the second wave of pandemic flu emerged at Camp Devens, a U.S. Army training camp just outside of Boston, and at a naval facility in Boston. ​In Texas, Dallas and San Antonio saw early outbreaks. More than 800 died in Dallas in October alone. In San Antonio, 53 percent of the population got sick. By early October, flu had spread across the entire states, affecting even smaller communities such as Midland. The disease became known around the world as the Spanish flu since Spain was hard hit by the illness and was not subject to the wartime news blackout that affected other countries. The world followed reports of Spain's King Alfonso XII's struggle with the flu. An unusual effect of this virus was that it struck down many previously healthy young people. It was most deadly to people ages 20 to 40. 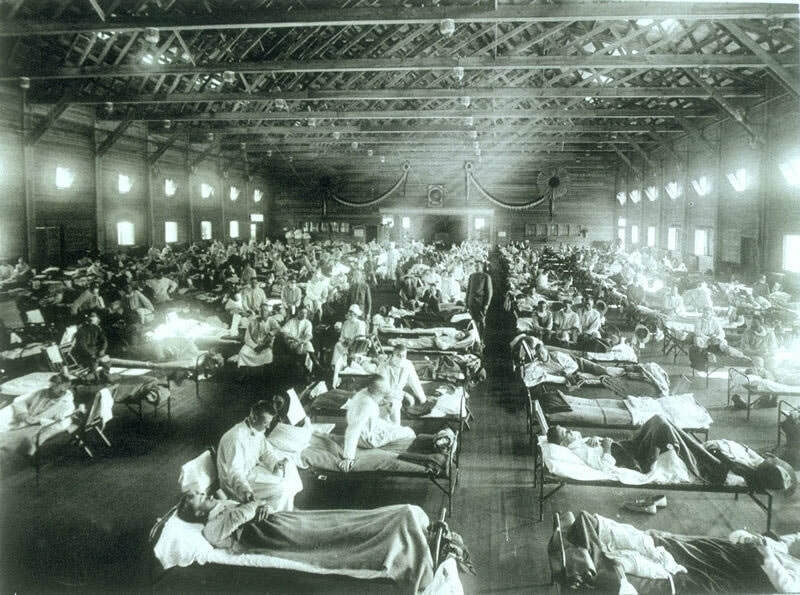 More U. S. soldiers perished from flu than in battle. An estimated 43,000 servicemen who mobilized for WWI died of influenza. ​ People were advised to avoid shaking hands and to stay indoors, libraries put a halt on lending books, and regulations were passed banning spitting. Some cities imposed ordinances requiring face masks in public. New York City even had an ordinance that fined or jailed people who did not cover their coughs. (9). The records in the Midland County History Museum Archives for these years are scarce. The exact number of how many died in Midland during the epidemic may now be unattainable, having faded into a hundred-years gone past. Perhaps some idea might still be obtained in a stroll through the older portions of Fairview Cemetery searching for those interred during the deadly months of 1918 and 1919. Yet, in studying something so devastating as the Spanish Flu the scale of the numbers can cause one to lose perspective. To forget that each of the numbers represents a human being who once held the same measure of living reality as those alive today. Even narrowing the focus to Midland, the remove in time can create an impersonal patina. But also within the sparse records in the museum, there are traces that breathe life back into a few of those long-dead Midlanders. 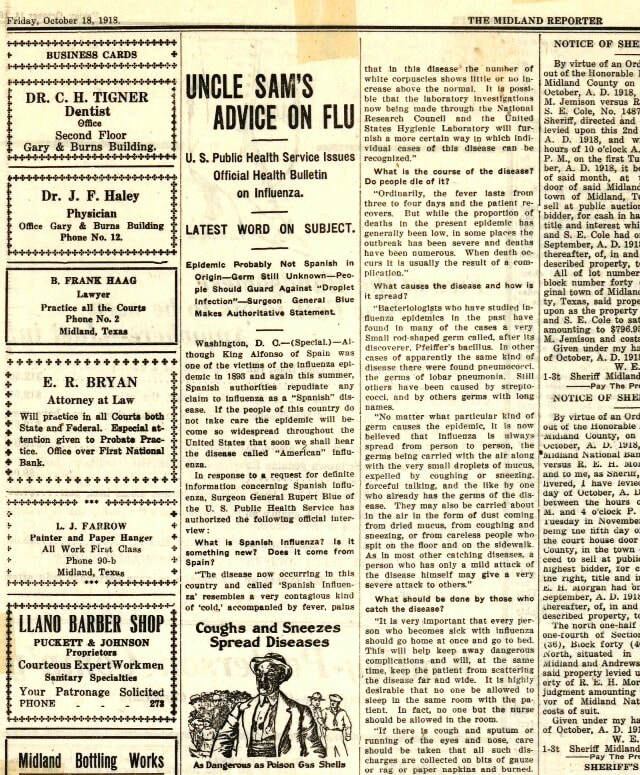 The front page of that October 18 newspaper is dominated by flu-related articles. Flu-related articles dominate the front page of Midland's paper. Among the news items is the funeral oration of young Oran Edwards, victim of the flu at age 33. Despite the growing dangers of congregating, people gathered in the small Methodist church on Main Street to hear Reverend J. W. Cowan's tribute. At age eight, Edwards came to Midland in 1893 with his family. As he grew to manhood, the good influences of church and school molded him into "a strong, sturdy, stalwart, influential and useful young man." 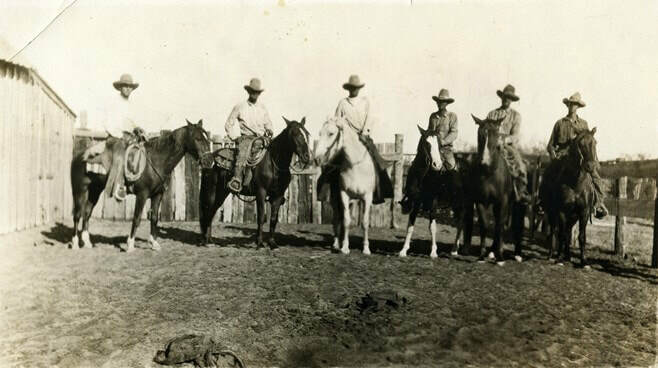 With his brothers, he built a successful ranching enterprise. Though beyond draft age, he enlisted because his "heart of a true patriot" made him long "to have some part in the great struggle being waged by his fellows for the cause of righteousness." He was sent to South Carolina, then to Quantico, Virginia, where, within a few days of contracting influenza, "his manly and useful young life came to a sudden and untimely end." Oran Edwards and Luke Cowan help put flesh and bone on all those thousands of dead young men. Their tombstones in Fairview Cemetery remain a silent testimony of those who died in such a sadly unheroic manner, without glory, leaving family and friends with pain and grief at the unfairness of it all. Multiply the story within Reverend Cowan's oration 1,800 times for Texas; 43,000 times for the United States, and one begins to gain a deeper sense of the scale of this epidemic. The archives contain one other item that helps make these events from a century ago more "real." On the same front page of The Midland Reporter that detailed the funeral of Oran Edwards is the notice of the death of another young Midland man. Carroll Holloway died from influenza on Wednesday, October 2 in Algiers, Louisiana. Following his enlistment in the Army, he was stationed in the radio department there. His illness was brief; death came quickly. Holloway left behind a wife and infant to mourn him, as well as his aged parents. He too joined Edwards and Cowan in Fairview. Among the archive photographs are several related to Midland Christian College, which operated during these years. The vast majority of the students attending the school came from Midland or the surrounding area. Just a short time before his enlistment, Holloway had been a student. One of the photographs was donated by early-day Midland resident Mollie McCormick, whose own son served in the Great War and fortunately escaped the influenza. In a real photo postcard, the Midland College Band poses on the steps of the Midland County Courthouse, sometime between 1915 and 1918. 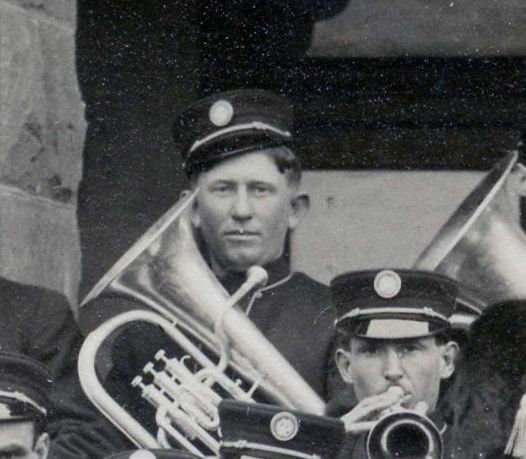 Fortunately, though there is no exact date, Mrs. McCormick or some archivist recorded the band members' names. And there on the back row, third from the left, is young Carroll Holloway, decked out in a different uniform than the one he would die in, solemnly posing proudly with his classmates. Neither he nor any of those standing with him had any idea he would be dead within such a short time.This weathered image puts a face on an all too brief biography. 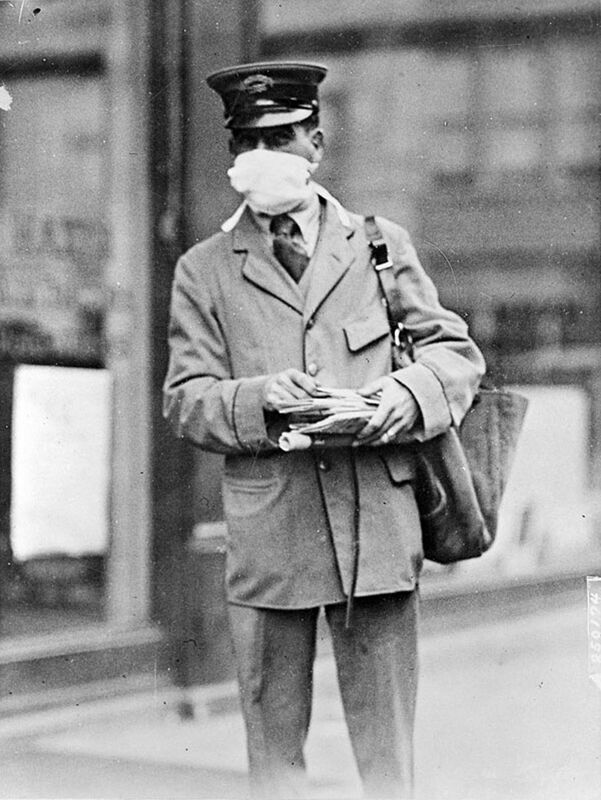 As one examines these frail artifacts--yellowed newspapers, faded photographs, threadbare journals, and weathered tombstones--the Midland of the year of the great flu epidemic becomes a far less distant place. (1) https://www.smithsonianmag.com/history/journal-plague-year-180965222/, accessed September 6, 2018. (2) https://www.history.com/topics/1918-flu-pandemic, accessed September 6, 2018. 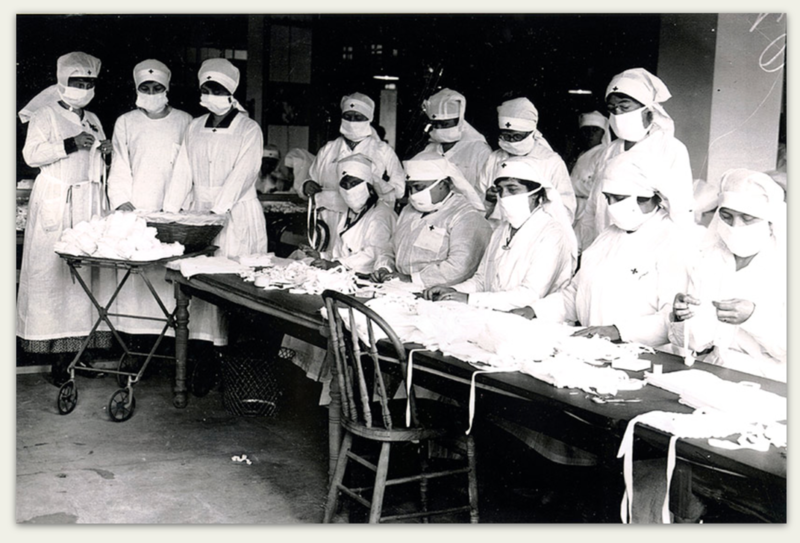 (3) https://www.cdc.gov/flu/pandemic-resources/1918-commemoration/pandemic-timeline-1918.htm, accessed September 6, 2018. (4) http://www.prosperpressnews.com/opinion/20180211/1918-flu-epidemic-in-texas, accessed September 6, 2018. (5) https://virus.stanford.edu/uda/, accessed September 6, 2018. (6) http://www.texasescapes.com/MikeCoxTexasTales/1918-Flu.htm, accessed September 6, 2018. (7) https://www.cdc.gov/features/1918-flu-pandemic/index.html, accessed September 6, 2018. (8) https://virus.stanford.edu/uda/, accessed September 6, 2018. (9) https://www.cdc.gov/features/1918-flu-pandemic/index.html, accessed September 6, 2018. (10) http://www.texasescapes.com/MikeCoxTexasTales/1918-Flu.htm, accessed September 6, 2018. (11) The Midland Reporter, October 18, 1918. (13) Ancestry.com. U.S., Navy Burial Records, 1898-1932 [database on-line]. Provo, UT, USA: Ancestry.com Operations, Inc., 2014. Quarterly Conference Record, Midland Methodist Episcopal Church, South, January 1916 to October 1918. Zachary Taylor Brown (known by most folks as Z. T.) and his family were tired of living in the small four room "shotgun" house on the lot they owned on Weatherford Street. As the second largest rancher in Midland County, Brown could certainly afford something far better. So, in 1899, he ordered a kit home for $2800 with ornate exterior oak trim, and a solid oak front door with detailed design. There was even one Gothic Arch window with blue, yellow, green and rose colored art glass around the edge for an extra touch of class. Brown hired T. B. Wadley to assemble the house for him while the family lived on their 76 section Railway Ranch southwest of Midland until it was completed. The structure Wadley assembled over 115 years ago still stands, but the community and world of 1899 in which it was built has long since passed into history. So what was that world like? 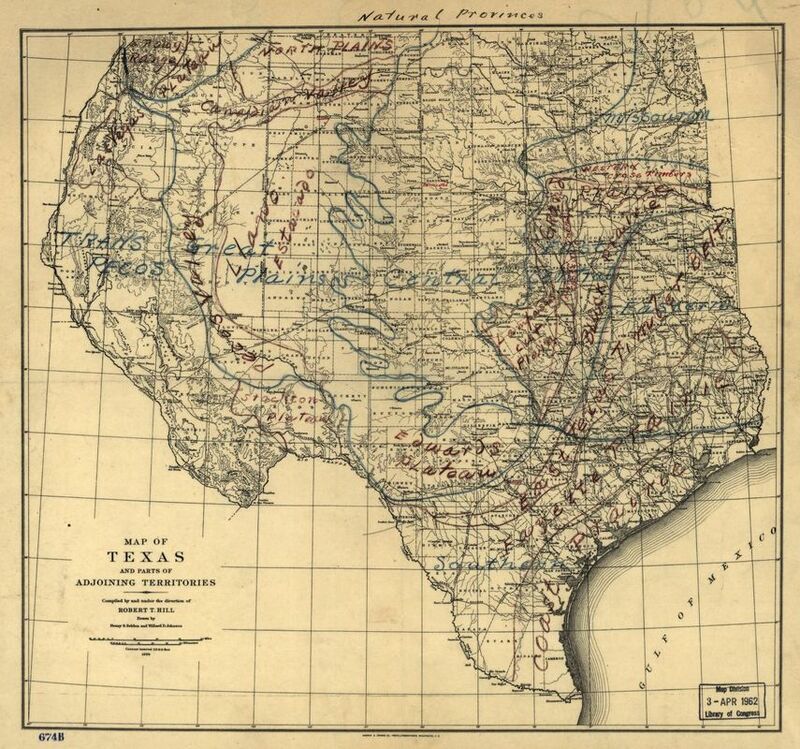 1899 Midland, and Texas, and the larger world beyond? Abilene (Main) Street around 1900, looking north from near the railroad tracks. Republican William McKinley was President of the United States, elected in 1896. McKinley, campaigning on a "Sound Money" platform (based on a gold standard for U. S. currency) defeated challenger William Jennings Bryan in 1896. McKinley would be the last American President to have served in the American Civil War, where he rose in the Union Army from enlisted man to brevet major. There were 45 stars in the flag that flew over the White House. It gained that number in 1896 when Utah became a state. McKinley had led the country through a brief and successful war with Spain which left the United States with possessions around the globe. Before the year ended, he would have another war on his hands--a bloody, guerrilla conflict in the Philippines. 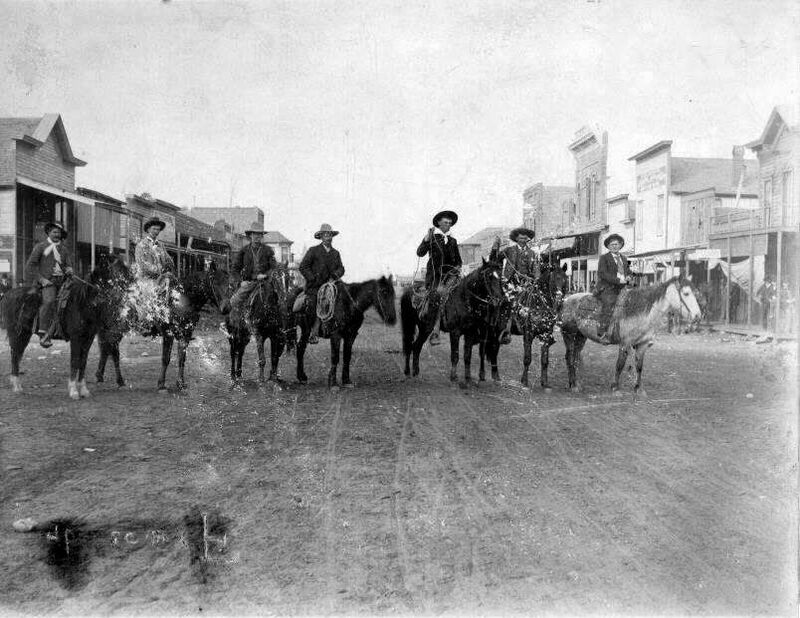 Midland in 1899 was still a raw frontier community, built mostly of wood, with a population of around 1,000, except on weekends and holidays when ranchers, farmers, and cowboys came to town for shopping, worship, and recreation. Wadley could have done very little construction of the Brown home in February as Texas and a large portion of the nation were struck with an outbreak of frigid weather that became known as the Great Blizzard or the Great Arctic Outbreak of 1899. A series of multiple storms within the first week of the month left a very deep snow pack over most of the Great Plains and Midwest, which kept the cold air from warming up as it moved out of Canada and toward the southern states. The Great Arctic Outbreak didn’t just bring cold to the nation. It also brought snow and ice and lots of it, deeply blanketing the eastern states and Midwest. Huge Ice chunks floated down the Mississippi River, past New Orleans, and into the Gulf of Mexico, forming an inch-thick layer of ice at the mouth of the Mississippi. Far-off wars might make interesting reading, but they had little impact on the small West Texas community. Cattle prices and the next rain were the primary conversation items. Progress on Z. T.'s new home probably also received its share of attention. A week later, on New Year's Eve, the Brown children might have been among those who used their dollar to purchase five dozen bottle rockets to welcome the new century. On a chilly January day, Z. T., Sarah, and their five children moved into their new two-story home on Weatherford Street. (1) https://en.wikipedia.org/wiki/Joseph_D._Sayers, accessed August 14, 2017. (2) James Collett and Doug Page, Midland: Postcard History Series, p. 10. (3) The Pioneer History of Midland County, Texas, 1880-1926, p. 15. (4) http://www.texasmonthly.com/articles/december-1899/, accessed August 16, 2017. (5) https://www.ncdc.noaa.gov/news/climate-history-great-arctic-outbreak-february-1899; https://blog.weatherstem.com/great-blizzard-of-1899/, accessed August 15, 2017. (6) https://www.ncdc.noaa.gov/sites/default/files/attachments/Monthly-Weather-Review-February-1899.pdf, accessed August 16, 2017. (7) https://en.wikipedia.org/wiki/Joseph_D._Sayers, accessed August 14, 2017; http://www.onthisday.com/events/date/1899. (9) The Pioneer History of Midland County, Texas, 1880-1926, p. 42. (10) http://www.texasmonthly.com/articles/december-1899/, accessed August 16, 2017. (11) The Pioneer History of Midland County, Texas, 1880-1926, p. 15. (12) http://www.texasmonthly.com/articles/december-1899/, accessed August 16, 2017. Most people heading for the Downtown Branch of the Midland County Public Library from the public parking lot pay little or no attention to the metal frame building they pass on the way. The Library is their destination and they are already focused on the goal that brought them here--to check out the latest book by a favorite author, to find a movie to entertain all the children home for the weekend, to do a bit of research, to enjoy some quiet reading time, or to take advantage of the public internet access. Once in a while, however, some of those library-goers, on their way to or from the parking lot, make the short detour to the museum door. A very few have actually been inside before (at least once upon a time) and have some idea of what they will find. For most, however, this is their first journey beyond the door. First timer or return timer, what they all discover is an adventure--the opportunity to wander through some most interesting Midland stuff. According to Eugene Dillenburg, a professor of Museum Studies, a museum is primarily about exhibits. (1) The defining feature that sets museums apart from libraries or courthouse or any other public place is exhibits. Museums have displays of things, real things. What Dillenburg called "stuff." As he explains, "Not pictures of stuff or descriptions of stuff, but stuff." And the central purpose of museums is to, in some manner, educate the public, by sharing that stuff. Museums arrange the various items into different configurations, or exhibits, and then invite the visitor to experience the realia, these real objects and materials from everyday life, displayed to educate. There are usually also signs with descriptions and explanations, but the most important thing remains the items themselves. And, even though the visitor usually cannot physically touch the items (it's too hazardous to these fragile time travelers), he or she can encounter these things in their full three-dimensional reality. And what stuff is in that metal building beside the library? What exhibits will a visitor discover? What education awaits? The Midland County Historical Museum is a time machine that has carried a fascinating collection of items from the past into the present to educate for the future. The binding force, the energy, that brought them here, is Midland. Everything in the museum has some connection with Midland County. Sometimes that kinship is obvious, strong and clear. At other times, it is highly obscure, with only the thinnest of threads linking the object--the stuff--to this place. Yet, everything that eventually arrived within that frame building journeyed there through a Midland time portal. The museum exhibits are thus an eccentric group, a kind of quirky assembly of all sorts of things. That makes them somewhat frustrating to view. At the same time, it also makes them quite charming. Anyone who spends any time examining the collection eventually arrives at the question, "What in the world is that doing here?" And the simple answer to that question is that these artifacts and exhibits provide information and insight into the history of this place--of Midland, of Midland County, of the Permian Basin. They offer tangible fragments of the past. They speak of who and what was once here and what they did and what happened. They even suggest comments upon the why of all that. And, of what use is that? In a place of such frequent and significant change as Midland, the fast pace frequently becomes disturbing, creating stress and anxiety. The sense of loss is heightened. Nostalgia fuels depression. Fear of change grows and a wish for a past world becomes exaggerated. This museum (in fact, any museum) helps people understand the world always changes. That there never was a single Midland that endured unchanged until progress suddenly leveled it. That those living here always dealt with new things, different things, things going up, things coming down, days of glory and days of dust. And, knowing that, perhaps those here today struggle a bit less desperately against the flow of change. Because not all is lost, just as not all is preserved. The physical exhibits in the museum remind each viewer that parts of the past lives on in the present, contributing to its form and direction and meaning. Novelist Catherynne Valente wrote about the dangers and challenges of change. (2) One of her characters explains, "For the wishes of one's old life wither and shrivel like old leaves if they are not replaced with new wishes when the world changes. And the world always changes. Wishes get slimy, and their colors fade, and soon they are just mud, like all the rest of the mud, and not wishes at all, but regrets." The Midland County Historical Museum is a place to help prevent regrets. Perhaps the next time you arrive nearby, you'll stop in and take a few moments to do a little time traveling. ​ You won't regret it! 1. Dillenburg, Eugene, (2011) "What, if Anything, Is a Museum?" Exhibitionist, Spring, 2011, (8-13). 2. Valente, Catherynne,(2011) The Girl Who Circumnavigated Fairyland In a Ship of Her Own Making (New York: Square Fish), 61. This blog will contain posts by different members of the Midland Historical Society and guest writers.